Cat eye discharge can be completely normal or something to bring to your vet’s attention ASAP. Here’s how to determine what’s worrying and what’s not. Do your cat’s eyes ever get watery, goopy or downright crusty? It can be a little gross, but beyond that, cat eye discharge can sometimes indicate an eye problem that needs to be looked at by your veterinarian. If you’ve ever wondered if your cat’s eye boogers are normal or what could be causing them, you’re not alone. 1. A small amount of discharge is probably nothing to worry about. “While technically a normal eye should not have any ocular discharge, a small amount of clear discharge, which may dry and appear slightly brown and crusty, may be OK,” Dr. Kimmitt says. If your cat just gets those morning eye boogers, the eyes are more than likely fine. 2. Some breeds are more prone to eye boogers. Due to the shape of the face, Persians, Himalayans and other cats with short noses and large, round eyes might have more eye leakage than other cats. This might be normal, but if the discharge is excessive, ask your vet. 3. Some cat eye problems warrant a trip to the vet. Yellow or green eye discharge is not normal — if your cat has colored discharge, make a vet appointment as soon as possible. 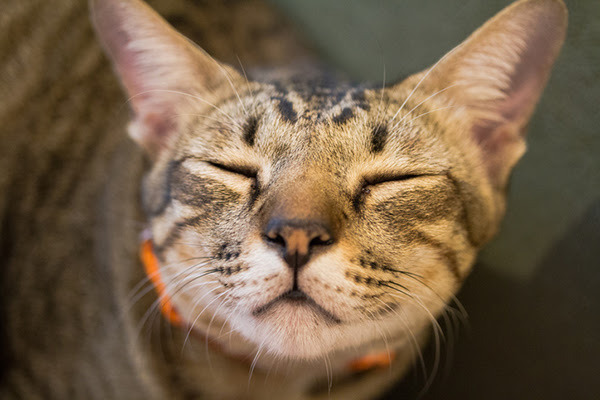 “If there is enough discharge that you have to wipe your pet’s eye(s) more than one to two times daily, or if your cat is squinting or frequently rubbing at its eye(s), or if the eye(s) look red, it should be seen by a veterinarian,” Dr. Kimmitt says. When it comes to your cat’s eye issues, don’t delay making that vet appointment — your cat’s eyes and eyesight might depend on it. 4. Many things can cause abnormal eye leakage in cats. Cat eye discharge is a sign of many different eye diseases and disorders, including corneal ulcers, conjunctivitis and entropion (an eyelid that rolls inward, allowing the hairs on the skin to irritate the eye). Your veterinarian will examine your cat and possibly perform certain tests to find out what exactly is causing your cat’s eye discharge. 5. It’s important to keep your cat’s eye area clean. Indoor Vs Outdoor Cat: Is It Ever OK to Let Them Roam? Outdoor Cat Controversy: Is It Ever OK to Let Them Roam? Pet parents commonly pose the question as to whether they should allow their cats to venture outside of the house. As a veterinarian and advocate for animal welfare, I explain that the decision is ultimately theirs, but to bear in mind that their cat is likely to use up her “nine lives” more quickly while outdoors. As with any controversial topic, there are both pros and cons to providing your cat with the opportunity to explore the great outdoors. There are many potential dangers faced by outdoor cats, but some risks can be mitigated. For example, outdoor cats exposed to the rabies and feline leukemia viruses can be protected by vaccines. Another virus that is more prevalent in outdoor cat populations is the feline immunodeficiency virus (FIV). Although a vaccine for FIV exists, its use is controversial. The risk for exposure to fleas, ticks, and mosquitoes is also greater for cats who spend time outside. These pests can transmit the agents that cause diseases, such as feline infectious anemia and heartworm. Responsible pet parents must ensure that their cat receives appropriate parasite preventatives to stay healthy. Another preventable problem associated with outdoor cats is unwanted pregnancies. Due to the persistent and staggering overpopulation issue, it is imperative to have your cats spayed or neutered before they are permitted outside. Unfortunately, unsupervised outdoor cats are at risk for several serious problems that cannot be easily avoided. Vehicular accidents are one of the most common life-threatening issues faced by outdoor cats. Encounters with other animals can also pose grave consequences. Bite wounds, if not detected early, can result in serious infections. Cats attacked by larger animals such as dogs, foxes, or coyotes have a low survival rate. Cats who roam outside are in jeopardy of being exposed to toxins such as antifreeze and rodenticides. If a cat ingests either product without the owner’s knowledge, the window of opportunity to administer an antidote is lost. Toxic outdoor plants such as lilies, azaleas, cyclamen, or the bulbs of tulips and hyacinth also endanger cats. While there are many sound reasons for keeping your cat indoors, there are several benefits associated with outdoor life. The majority of outdoor cats maintain a healthy body weight. As opposed to their strictly indoor couch potato counterparts, outdoor cats play and run and therefore burn many more calories. The importance of environmental enrichment for cats is strongly touted by veterinary behaviorists. Although cat parents can be creative in initiating indoor games, the mental stimulation experienced outdoors is ideal. Exposure to live prey allows cats to partake in natural hunting activities. Hunting outdoors serves as an outlet for stalking and aggression that might otherwise be directed toward other household pets and family members. For cat parents, channeling their pet’s scratching tendency toward trees and other natural surfaces is much preferred compared to leather furniture or Berber carpeting. In order for cat parents who live in a highly trafficked area to strike a happy balance, they can consider leash walking their cats in a harness or allowing their cats to explore and exercise within an enclosed yard under supervision. Whether you choose to allow your cat to roam outside or keep it indoors, be sure to take measures to ensure both her physical and mental well-being. November is nationally recognized as American Diabetes Month, a month focused on raising awareness about diabetes in people. Not as commonly known is that November is also recognized as Pet Diabetes Awareness Month. A growing epidemic amongst our pets, recognizing and spreading awareness about diabetes in dogs and cats is vital to helping pet owners spot and treat the disorder early. Drinking more water than usual, known as polydipsia, is an early warning sign of diabetes. If your cat or dog suddenly acts as if it is always starving, despite eating the usual amount (known as polyphagia), and maintains or loses weight despite increased food intake, this can be a sign of diabetes as well. Obesity can actually cause diabetes to develop; therefore, if your pet is obese you should keep an eye on it to determine if it is developing any symptoms of diabetes. Diabetes can cause wasting of back muscles or weakness in the back legs of cats. With dogs there may just be a general sense of lethargy, being less active, or sleeping more. Another side effect of ketoacidosis, if your pet’s diabetes has escalated to this point before it’s been recognized, is vomiting. Ketoacidosis is more commonly found in older pets and in females. Dachshunds and Miniature Poodles are also predisposed to it.